Guernsey FC's record goalscorer Ross Allen says the Island Games has been the perfect preparation for their forthcoming Isthmian League campaign. 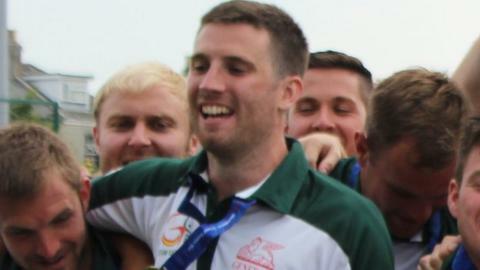 Guernsey won their first football gold medal for 12 years as they cruised to victory in Jersey earlier this month. "Winning gold has given us a bit of a surge to go forward this season and really push for promotion," Allen said. "Everyone's on a high, we've done our pre-season now and we can just focus on the football and work on our shape." Guernsey had to play five games in six days and all but one of the squad that represented the island were part of the Guernsey FC set-up. "It felt like a pre-season event and I think if we lost in that final it would have been a bitter thing to take," Allen told BBC Radio Guernsey. "But winning does really breed wanting to win more." "I think it's given everyone a bit of energy and boost to take it on and see where we can go to try and get the good start that we need in the league."